Women on a Mission: Mom Edition: MISSION QUANTUM LEAP: CHIA SEEDS! Here’s another GREAT tip and yummy idea from Danika. Remember, here she told us all about how to keep your buttons organized. Danika first heard about these seeds on the Dr. Oz show. They are all natural, tasteless, and are packed with omega 3’s, protein, anti-oxidants, and fiber. Supposedly, they are supposed to fill you up and keep you full. This means less food in my tummy! It’s a win-win! Danika whipped up a smoothly for me this morning with frozen fruit (peaches/mango). She uses frozen fruit, because it is cheaper and requires no added ice. She also put in peach yogurt and apple juice (to get the right consistency). She ended up adding 4 Tablespoons of Chia Seeds. Actually, I think it worked. 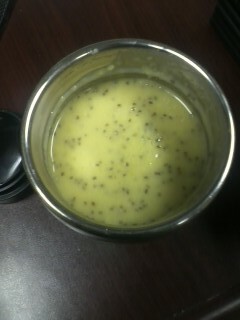 The smoothie was DELICIOUS! And I wasn’t super hungry by lunch time! 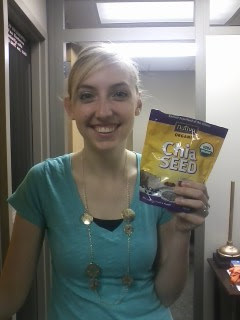 Danika bought her Chia Seeds at GMC; however, you could buy these at any health food store. I made a chia seed smoothie this morning - frozen fruit, yogurt, fresh blueberries and fruit juice. Yummy! Mine was 1 serving, and so I probably used 1 T of chia seeds, tho in a magazine it said they expand to 10 times their original size, which is why they fill you up so well, on top of all their omega-3 and other good-for-your properties! If you have a Trader Joe's nearby, that's where I got mine.